As part of one of my current projects, I've got just over 20 some bikes to finish for a friend of mine. This guy in particular needed his arm repaired. So I not only do I do new custom work, I do repair work as well for those interested. I've actually got some Imperial Guard troops I'm working on for another guy where I'm painting shoulder pads and I'm doing a little bit of additional "repair" work on them as well. 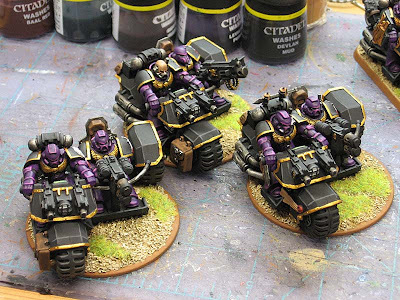 So far, I've got the 3 attack bikes done. To make them consistent with the regular bikers, I added flying bases underneath them. It allows me to add some basing to the models so they fit with the rest of the force better now (at least visually). And... it doesn't increase their footprint any so it's got no real in-game effects other than making them look good. That's quite a project Ron. 20 bikes is A LOT of repetition. Best of luck on this one. The Attack bikes look great. Wow, impressive to see that many bikes. Good luck. Like the bases on the attack bikes -- it really does tie it together. I am still trying to convince myself to finish painting the 60 some odd bikes that I own for my white scars... so I feel your pain! Wow that is a ton of bikes! Perhaps even a metric ton. 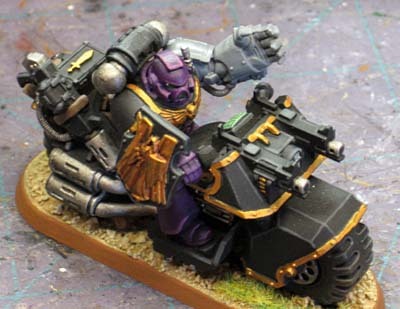 The attack bikes look great and you were totally right in putting the bases on them. I always thought it looked weird to see everything on bases EXCEPT the attack bikes. Oh, one last think MOAR BIKES! 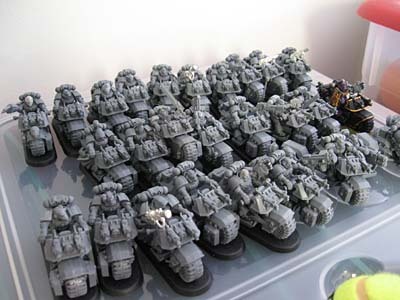 My marine bikers will have about 39 models plus Land Speeders. I feel sorry for me. Duke: That's a ton of bikers and painting one of those is like painting two regular models. Anon: Very true. Stick to the fluff and I think you'll have an army that's more fun to play in the end.